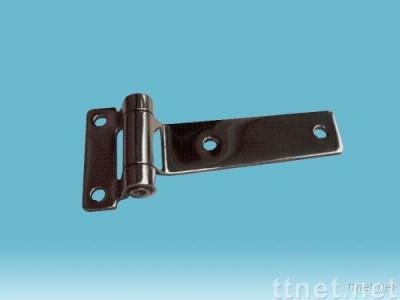 LEAF HINGES FEATURE: ?Corrosion-resistant stainless steel is used. ?The curled sections are welded. ?Board hinge with 2 pieces of ribs withstands vibration occurred with closing and opening of the door. ?Suitable for large and heavy doors such as cold storage and chill cars. ?This leaf hinge may be installed for either right or left, which is determined by the direction in which the pin is inserted. ?The nylon bush provides smooth movement of the door. ?The pin will not be loosened for that the pin is tightened with the U nut.